Machine learning methods can be used to train a trainable classifier to detect features of interest. In the tutorial below we describe how to train and use the first trainable classifier we have made available in PlantCV. See the naive Bayes classifier documentation for more details on the methodology. Check out our interactive machine learning tutorial! 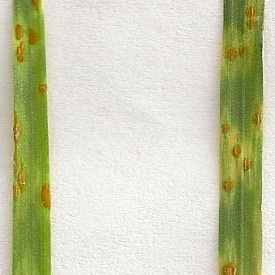 The naive Bayes approach used here can be trained to label pixels as plant or background. In other words, given a color image it can be trained to output a binary image where background is labeled as black (0) and plant is labeled as white (255). The goal is to replace the need to set binary threshold values manually. To train the classifier, we need to label a relatively small set of images using a binary mask (just like above). We can use PlantCV to create a binary mask for a set of input images using the methods described in the VIS tutorial. For the purpose of this tutorial, we assume we are in a folder containing two subfolders, one containing original RGB images, and one containing black and white masks that match the set of RGB images. 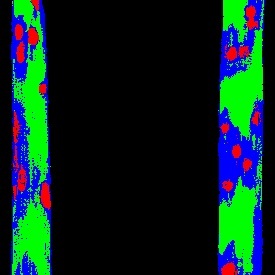 First, use plantcv-train.py to use the training images to output probability density functions (PDFs) for plant and background. The output file from plantcv-train.py will contain one row for each color channel (hue, saturation, and value) for each class (e.g. plant and background). The first and second column are the class and channel label, respectively. The remaining 256 columns contain the p-value from the PDFs for each intensity value observable in an 8-bit image (0-255). Once we have the plantcv-train.py output file, we can classify pixels in a color image in PlantCV. See the naive Bayes classifier documentation for example input/output. The naive Bayes multiclass approach is an extension of the naive Bayes approach described above. Just like the approach above, it can be trained to output binary images given an input color image. Unlike the naive Bayes method above, the naive Bayes multiclass approach can be trained to classify two or more classes, defined by the user. Additionally, the naive Bayes multiclass method is trained using colors sparsely sampled from images rather than the need to label all pixels in a given image. Each column in the tab-delimited table is a feature class (in this example, plant, pustule, chlorosis, or background) and each cell is a comma-separated red, green, and blue triplet for a pixel. 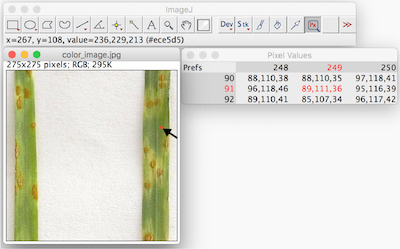 To collect pixel samples, open the color image in ImageJ. Use the Pixel Inspector Tool to select regions of the image belonging to a single class. Copy and paste the pixel red, green, and blue values into a spreadsheet or text editor and reformat into a single column per class. In this example, nine pixels are sampled with one click but the radius is adjustable. Once a satisfactory sample of pixels is collected, save the table as a tab-delimited text file. Like the naive Bayes method described above, use plantcv-train.py to use the pixel samples to output probability density functions (PDFs) for each class. The output file from plantcv-train.py will contain one row for each color channel (hue, saturation, and value) for each class. The first and second column are the class and channel label, respectively. The remaining 256 columns contain the p-value from the PDFs for each intensity value observable in an 8-bit image (0-255). Once we have the plantcv-train.py output file, we can classify pixels in a color image in PlantCV using the same function described in the naive Bayes section above. A plotting function pcv.visualize.colorize_masks allows users to choose colors for each class. # functions (PDFs) for plant and background.